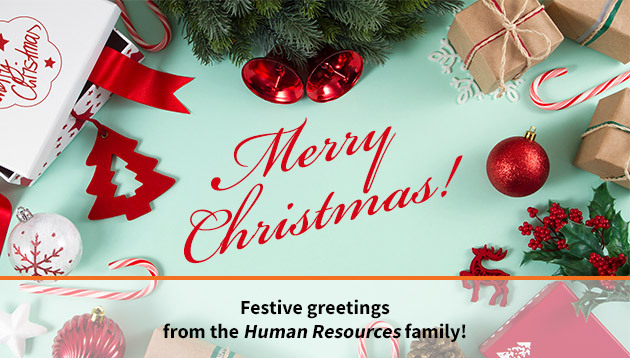 Season’s greetings from the Human Resources family! May your bellies be full and your hearts be warm with the joys of the festive season. On this occasion, we’re taking some time to think back on the past year and how the HR leadership is gearing towards creating more inclusive and supportive working environments that champion diversity, employee wellness and work-life balance. This too calls for a celebration! How can HR keep order in the office while avoiding being a party pooper at the holiday party? According to Cascade HR, there are five key areas the HR department should be aware of when planning an approach to the office festivities. Find out what they are here. 2. Do you encourage employees to listen to music while working? Most would assume that working in pin-drop silence is the best for productivity, but research from Accountemps shows otherwise. 71% of staff who are allowed to listen to music at work report being at least somewhat more productive when music is playing at the office. Read more about the effects of music here. A large majority of companies host annual holiday parties and that would mean the potential to embarrass yourself is high. According to a new survey by Four Loko, 18% of respondents have been embarrassed to go to work the day after the party, 9% have been reprimanded for their behaviour, and 7% have admitted getting into trouble with the law during or after the party. Discover more office party shenanigans here. In today’s workplace environment where employee preferences evolve at a rapid pace, employers cannot afford to ignore the importance of work-life harmony as a tool to engage and motivate their talent. Uncover how organisations can do just that here. Christmas, like many other festivals, is about sharing and giving. The survey found that 94% of the respondents think that a gift from their employer makes them feel appreciated, and choosing the right present is important when it comes to staff satisfaction. Find out which gifts get the red light and which get the green light here. According to Pew Research Center’s survey, 89% of adults say it is essential for today’s business leaders to create a safe and respectful workplace. This ranks at the top of a list of qualities and behaviours the public views as essential for corporate leadership. Read more over here. When you think about the festive season, what comes to mind usually include holiday parties, bonuses, gifts, and generosity. Yet, this is not the case in some companies where it is “business as usual”. Learn more about why this is the case here. In just a week, we will be into 2019 and a new year also means a new list of holidays to capitalise on! If you haven’t already marked out Singapore’s public holidays for 2019, here’s a compilation of the Ministry of Manpower’s handy catalogue to add them all to your calendar. A new research from Binghamton University, State University at New York found that men are more likely to experience mental wellbeing until nutritional deficiencies arise. Women, however, are less likely to experience mental well-being until a balanced diet and a healthy lifestyle are followed. Check out the full story here. 10. Can bosses and employees be friends? The idea of friendship applies as much to our personal lives as it does to our professional ones. In this survey, Instant Offices looks into the implications and shares some tips on how to be a boss and a friend. Find out what they are here. Have a great Christmas and an equally joyous New Year! UK sleep expert claims today's office hours are against our biological clocks, warning poor quality of sleep leads to low producti..